We can supply the necessary items you will need when planting any of our fruit trees. 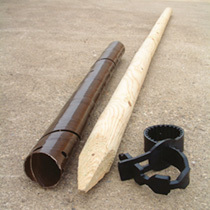 Pack includes one 1.2m (47") treated timber stake, plastic tie plus a spiral guard to protect the tree from rabbits etc. PLEASE NOTE: If ordering trees please try to order at the same time as they may then be sent out together.